Hi, my name is Scott Hughes. Jupiter and Pearl show stock is my specialty. We have the largest selection of Jupiter and Pearl show stock in the area. 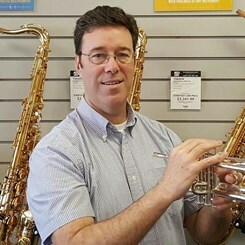 To view some of the instruments in stock, check out my "GEAR LIST". For incredible show stock deals, contact me at the Cool Springs location at 615-771-3113. My love of music started when I was a kid. My first favorite song was Hey Jude by the Beatles. I started playing guitar when I was 15 and I took years of lessons. When I went to MTSU, I learned as much classical guitar as I could before graduating with a Recording Industry Management degree in 1990. I spent 15 years doing live audio at the club level, mixing band and operating lighting consoles. I have been in the music retail busines for over 20 years.